There may be times when you will need to reopen a Quiz for a test-taker or have them go back into the Quiz that is in progress. With ClassMarker's quiz maker online, you can create a 'Resume Test' link for Quizzes that are in progress, which will allow the user to pick up right where they had left off. Or, for those users that have finished the Quiz, you can reopen completed exams for resuming. Go to the user's individual results page and click Resume Link. 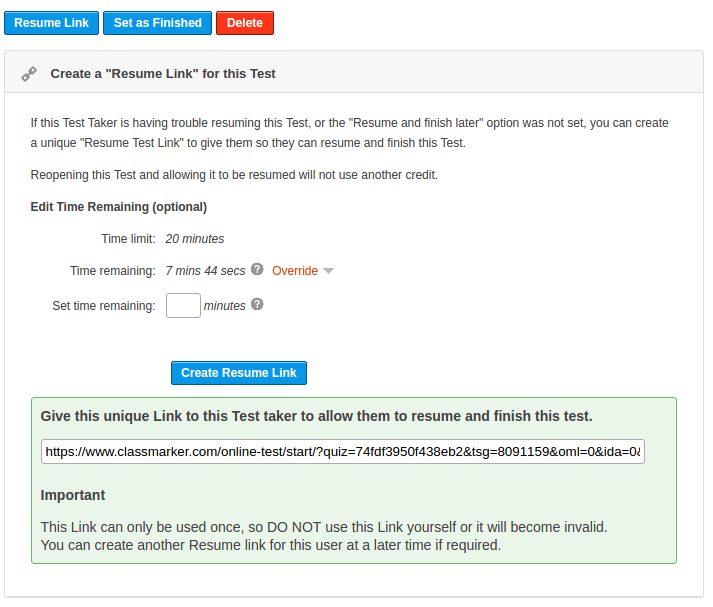 "If this Test Taker is having trouble resuming this Test, or the "Resume and finish later" option was not set, you can create a unique "Resume Test Link" to give them so they can resume and finish this Test. Reopening this Test and allowing it to be resumed will not use another credit." Please Note: The link can be used only one time. So, please do not test it to make sure it works as it will then become invalid. Click on the blue button 'Create Resume Link'. Your link has now been created to provide to your test-taker. If there is a timer set on a Quiz, you can issue more time for the Quiz for a particular user, if required. Edit Time Remaining (optional) - you would use this if you want to override the time set. Time Limit: Displays the time you have allocated for the Quiz. Time Remaining: Displays the time the test-taker has remaining in the Quiz. If you select to override the timer for this particular user, you will select a new time remaining in which this will be the new time that a user has to finish their Quiz. So, if you were to set the new time to 30 minutes for example, this will then override the time remaining and the user will now have 30 minutes to finish their Quiz. Timed Tests - the user has no available time left and you want to provide them with additional time. Computer Crash - the user cannot back into the Quiz. User had to leave test unexpectedly - Maybe there was an emergency or something they needed to tend to, where they were unable to finish their Quiz. Accidental closing out of the Quiz. There are many reasons as to why you may need to have a test-taker go back into a Quiz that is still in progress or a completed one. No worries however, because with ClassMarker's online quiz maker, we have made it possible! How do I Reopen a Completed Exam? How do I Embed an Exam on my Website? How do I Sell My Quizzes Online? How do I Brand my Tests?